This is a special retrospective on the Informationists, an experimental poetry group including Robert Crawford, W.N. Herbert, David Kinloch, Peter McCarey, Alan Riach and Richard Price. It contains introductions and retrospectives from Richard Price and Alan Riach. 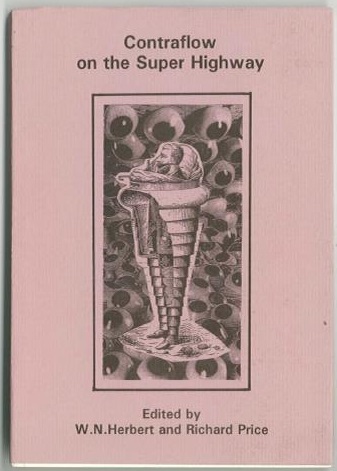 Also included is a new introductory preface by Dorothy Lehane, written especially for the planned Italian translation of the group anthology ‘Contraflow on the SuperHighway’ (see the Diafora website here). Ten poems from the anthology are also part of this feature. Informationism at Twenty-One: Richard Price and Alan Riach introduce a retrospective on ‘Contraflow on the SuperHighway’. Information and Poetry: Encountering the Informationists – by Dorothy Lehane. The Informationists 1: Poems by W. N. Herbert, David Kinloch, Peter McCarey, Richard Price, and Alan Riach. The Informationists 2: Poems by David Kinloch, Peter McCarey, Richard Price, and Alan Riach. Five Finger Informationism – by Richard Price. W. N. HERBERT is Professor of Poetry and Creative Writing at Newcastle University. His collections include Forked Tongue and the two-variant, two volume Omnesia. DOROTHY LEHANE is the editor of Litmus magazine and author of Ephemeris (Nine Arches Press, 2014) and Places of Articulation (dancing girl press, 2014). She teaches Creative Writing and is a PhD candidate in Poetry: Text as Practice at the University of Kent. Her research explores perceptual and social experiences of neurological speech conditions; questions concerning the ethics of representational projects, vulnerable subjects, issues surrounding permission and problematized notions of authorship. Recent poems have been published in Snow 3 and Molly Bloom and she has work forthcoming in Tears in the Fence and Shearsman. PETER MCCAREY was born in Paisley and brought up in Glasgow. His work is accessible on his Syllabary website. Collected Contraptions was published by Carcanet in 2011. RICHARD PRICE‘s collections include Lucky Day (2005), Rays (2009), and Small World (2012), all from Carcanet. He is Head of Contemporary British Collections at the British Library. ALAN RIACH‘s collections include This Folding Map (1990), An Open Return (1991), First & Last Songs (1995) and Homecoming: new poems 2001-2009 (2009). He is the author of Representing Scotland in Literature, Popular Culture and Iconography: The Masks of the Modern Nation (Palgrave Macmillan, 2005) and co-author of Arts of Resistance: Poets, Portaits and Landscapes of Modern Scotland (2008). He is Professor of Scottish Literature at the University of Glasgow.